Now for the first time ever, the Cat in the Hat appears in a silly, Seussian flap book, which offers loads of learning and lots of laughs and is packed with over 50 seek-and-find flaps that help teach basic concepts such as colors, numbers, letters, shapes, and opposites! 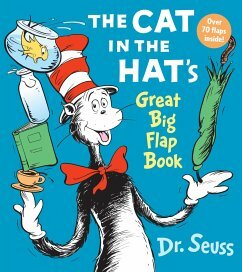 Inspired by five all-time best-selling Beginner Books®, this Seussian tour de flap includes: * Counting with the Cat in the Hat himself, from 1 fish to 20 Zeds (with hair on their heads!) * Animal sounds, courtesy of Mr. Brown (Yes, he can moo! Lift the flap and you'll moo, too!) * Rhyming games and wordplay inspired by There's a Wocket in My Pocket! and One Fish Two Fish Red Fish Blue Fish * And as if all this weren't enough -- Dr. Seuss's ABC in 26 flaps!